LDS Patriarch John Smith gave John Burton a Patriarchal blessing on 18 August 1850. At the time of that blessing Burton said he was born in 1797 at Campbell County, Virginia to Zachariah and Jenny but offered no last names for his parents. Burton was born into slavery and likely did not know his mother's and father's last names. At some point John Burton became the property of John Burton, a white man living in Pike County Missouri. Burton, the white enslaver, married Susan McCord on May 24, 1835 in Pike County and brought the enslaved John Burton into the marriage with him. At some point in the 1830s Susan McCord, John Burton, the white enslaver, and John Burton the black enslaved man, joined the Church of Christ, as the Church of Jesus Christ of Latter-day Saints was known at the time. No baptismal records survive. Mary Jane, I am glad that you thought enough of me to mention me in your letter. Tell Aunt Maria that I have not forgot her kindness to me. Tell your Father that I was glad he sent me a shirt for I was in want of one. I understand that you have a good prospect of having plenty of fruit. Be so kind as to send me a little if you have a chance. I am suffering with chills and fever, but I feel good in spirits. I rejoice everyday of my life in the spirit of Mormonism. Give my respects to all the family. Joseph Lee Robinson Papers, MS 7042, Autobiography, 27 June 1846, Church History Library, Church of Jesus Christ of Latter-day Saints, Salt Lake City, Utah. Church of Jesus Christ of Latter-day Saints, Record of Members Collection, Parowan Ward. CR 375 8, box 5250, folder 1, image 18, Church History Library, Church of Jesus Christ of Latter-day Saints, Salt Lake City, Utah. United States Census, 1850. Parowan, Iron County, Utah Territory. United States Census, 1860. Parowan, Iron County, Utah Territory. Burton, Donald E. History of John Burton, 1797 – 1865. MS 21263, typescript. Church History Library, Church of Jesus Christ of Latter-day Saints, Salt Lake City, Utah. 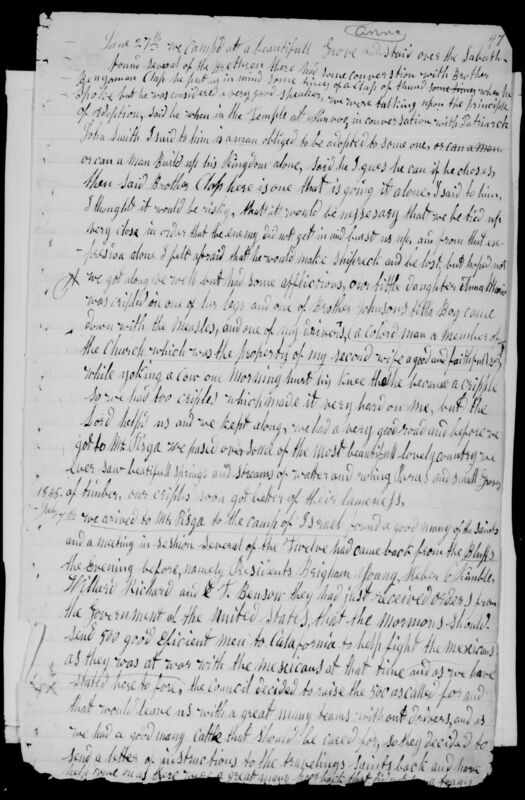 Rance Hutchings research notes, in Donald E. Burton, History of John Burton, 1797 – 1865, typescript, p. 25, MS 21263, Church History Library, Church of Jesus Christ of Latter-day Saints, Salt Lake City, Utah. Joseph Lee Robinson Papers, MS 7042, Autobiography, 47, Church History Library, The Church of Jesus Christ of Latter-day Saints, Salt Lake City, Utah. Joseph Lee Robinson Papers, MS 7042, Records, 1846-1847, Reel 1, Folder 4. Joseph Lee Robinson Papers, MS 7042, Autobiography, 67. James Godson Bleak, Annals of the Southern Utah Mission: 1850-1869, MS 318, box 1, folder 1, page 5, Church History Library, The Church of Jesus Christ of Latter-day Saints, Salt Lake City, Utah. United States Census, 1850, Parowan, Iron County, Utah Territory. Joseph Lee Robinson Papers, MS 7042, Autobiography, 76-77. Church of Jesus Christ of Latter-day Saints, Record of Members Collection, Parowan Ward, CR 375 8, box 5250, folder 1, image 18, Church History Library, Salt Lake City, Utah. United States Census, 1860, Parowan, Iron County, Utah Territory. Donald E. Burton, History of John Burton, 1797 – 1865, typescript, 19-20, MS 21263, Church History Library, Church of Jesus Christ of Latter-day Saints, Salt Lake City, Utah.